Despite dominating for large periods of the game the Jacks had to settle for a 1-1 draw against Sorrento in Week Two of the NPL Night Series at Percy Doyle Reserve on Friday night. 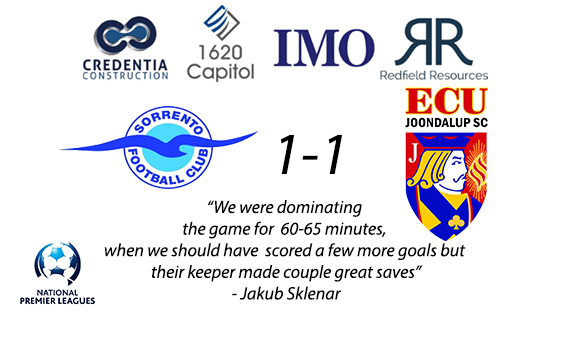 Joe Knowles made it two goals in two games in the competition firing home after 10 minutes, and the Jacks created a number of chances in a dominant first half but Sorrento keeper James Morgan was inspired form. A great move down the flank ended with Richard Howles, whose cross picked out Jakub Sklenar, who made great connection with the ball but Morgan produced a stunning save to deny him. Then Knowles, whose pace caused Sorrento problems all night, raced past his marker and his low shot looked destined for the bottom corner but Morgan got down well to deny him. After the break Knowles was in one-on-one with the Sorrento custodian when the ball broke to him in the box, but Morgan stood tall to block his shot. But despite all their pressure Sorrento found an equaliser 15 minutes from time, when referee Steven Gregory pointed to the spot after Reece Vittiglia fell under a challenge from Luke Palmeteer. It looked a little harsh but Vittiglia picked himself up score past Johnny Perkins to level. Both sides had late chances but there were no more goals and the points were shared. There were some positives to come out of the game and new striker Jakub Sklenar said some of the lead up play was outstanding. “We were dominating the game for 60-65 minutes, when we should have scored a few more goals but their keeper made couple great saves,” he explained. “Creating chances doesn’t seem to be that difficult for us at the moment and some of our lead up play is good, but it’s more about be calm and relaxed inside the box.